To attend trainings and continuing education courses, hospital and laboratory staff working outside of urban areas may need to travel long distances to reach the nearest referral or teaching hospital. Obstacles such as limited budgets, insufficient human resources, unsafe road conditions and political strife can restrict the capacity-building opportunities of medical laboratory and other healthcare professionals. Global Health Trials (globalhealthtrials.org) is tackling this problem and, consequently, improving the quality of clinical research around the world with its free, online e-Learning Centre. Launched in 2009, Global Health Trials is a platform for researchers to share and exchange expertise. The programme provides an online platform with an extensive library of free resources for clinical study investigators and staff, made possible through contributions from researchers around the world. With limited resources available to clinical research staff in low-income countries, Global Health Trials’ e-Learning Centre of open-access courses, seminars, documents and links to other relevant websites has been revolutionary for the global health research community. Information on the Global Health Trials website is provided in a universally accessible and practical format and is neither disease nor region specific. The site addresses all aspects of clinical studies, including designing, planning, implementing and reporting. Screenshot of the Global Health Trials e-Learning Centre. Image reproduced with the kind permission of Global Health Trials. The Global Health Trials online e-Learning Centre offers e-Learning Courses, e-Seminars, a resource library and access to other e-learning links. 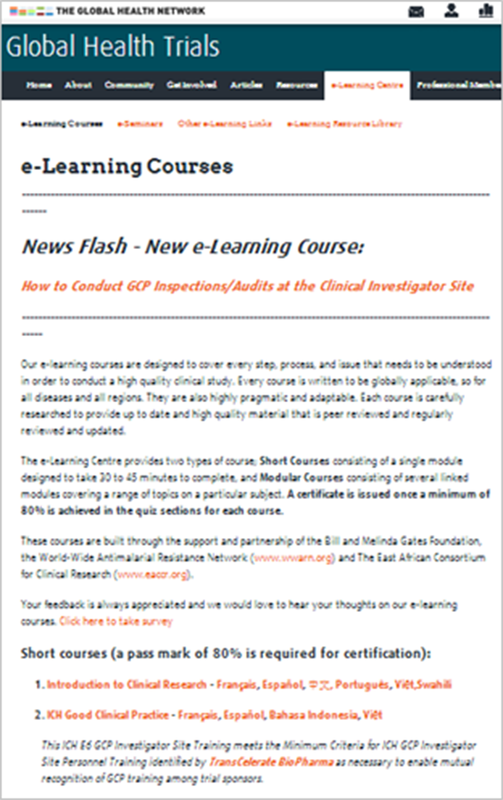 The e-Learning Courses are one of the most popular areas of Global Health Trials and provide relevant and applicable training in all aspects of developing and conducting high-quality clinical studies. To ensure accuracy in a frequently evolving field, materials for the courses are peer-reviewed and updated regularly. Participants receive a certificate of completion for a course once they achieve a minimum score of 80% in the final course quiz sections. The e-Learning Centre provides two types of courses: Short Courses consisting of a single module designed to take 30 to 45 minutes to complete, and Modular Courses consisting of several linked modules covering a range of aspects of a particular subject. There are currently 14 Short Courses on topics including study protocol development, reporting adverse events, and basic malaria microscopy. Some courses have been translated into as many as six languages. Global Health Trials is responsive to researchers’ requests and is always looking for input from experts in the field. As a result, new courses are added regularly to the site; upcoming courses include “Essential Elements of Ethics in Protocol Writing,” “Good Clinical Laboratory Practice,” and “Laboratory Quality Management Systems”. Additionally, several e-Seminars are available for free on the website. These lectures by senior scientists and researchers in Kenya, South Africa, Thailand and the UK, cover subjects such as ethics, laboratory set-up in resource-limited settings, working with government hospitals, and human immunity to malaria. Supplementing these dynamic courses and seminars is Global Health Trials’ extensive Resource Library of documents, guidelines, templates and tools, aiding researchers in protocol development, reporting adverse events, understanding research ethics and data management. Visitors can also find many links to other organisations’ websites with e-learning resources. Global Health Trials is presented as a collaborative project, encouraging all visitors to provide feedback and to share new resources with the broader community. It fosters a climate of sharing, consequently improving clinical research and promoting capacity building in areas where access to information and training has been limited or unavailable.